"Logography" redirects here. For the printing system invented by Henry Johnson, see Logography (printing). In written language, a logogram or logograph is a written character that represents a word or phrase. Chinese characters (including Japanese kanji) are logograms; some Egyptian hieroglyphs ANRSSAWS and some graphemes in cuneiform script are also logograms. The use of logograms in writing is called logography, and a writing system that is based on logograms is called a logographic system. Logographic systems include the earliest writing systems; the first historical civilizations of the Near East, Africa, China, and Central America used some form of logographic writing. A purely logographic script would be impractical for most languages, and none is known, apart from one devised for the artificial language Toki Pona, which is a purposely limited language with only 120 morphemes. All logographic scripts ever used for natural languages rely on the rebus principle to extend a relatively limited set of logograms: A subset of characters is used for their phonetic values, either consonantal or syllabic. The term logosyllabary is used to emphasize the partially phonetic nature of these scripts when the phonetic domain is the syllable. 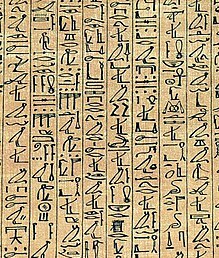 In both Ancient Egyptian hieroglyphs and in Chinese, there has been the additional development of fusing such phonetic elements with determinatives; such "radical and phonetic" characters make up the bulk of the script, and both languages relegated simple rebuses to the spelling of foreign loan words and words from non-standard dialects. None of these systems is purely logographic. This can be illustrated with Chinese. Not all Chinese characters represent morphemes: some morphemes are composed of more than one character. For example, the Chinese word for spider, 蜘蛛 zhīzhū, was created by fusing the rebus 知朱 zhīzhū (literally 'know cinnabar') with the "bug" determinative 虫. Neither *蜘 zhī nor *蛛 zhū can be used separately (except to stand in for 蜘蛛 in poetry). This is incorrect because the second character could be used separately. In Archaic Chinese, one can find the reverse: a single character representing more than one morpheme. An example is Archaic Chinese 王 hjwangs, a combination of a morpheme hjwang meaning king (coincidentally also written 王) and a suffix pronounced /s/. (The suffix is preserved in the modern falling tone.) In modern Mandarin, bimorphemic syllables are always written with two characters, for example 花儿 huār 'flower [diminutive]'. A peculiar system of logograms developed within the Pahlavi scripts (developed from the Aramaic abjad) used to write Middle Persian during much of the Sassanid period; the logograms were composed of letters that spelled out the word in Aramaic but were pronounced as in Persian (for instance, the combination m-l-k would be pronounced "shah"). These logograms, called hozwārishn (a form of heterograms), were dispensed with altogether after the Arab conquest of Persia and the adoption of a variant of the Arabic alphabet. Logograms are used in modern shorthand to represent common words. In addition, the numerals and mathematical symbols are logograms – 1 'one', 2 'two', + 'plus', = 'equals', and so on. In English, the ampersand & is used for 'and' and (as in many languages) for Latin et (as in &c for et cetera), % for 'percent' ('per cent'), # for 'number' (or 'pound', among other meanings), § for 'section', $ for 'dollar', € for 'euro', £ for 'pound', ° for 'degree', @ for 'at', and so on. Typical Egyptian usage was to augment a logogram, which may potentially represent several words with different pronunciations, with a determinate to narrow down the meaning, and a phonetic component to specify the pronunciation. In the case of Chinese, the vast majority of characters are a fixed combination of a radical that indicates its nominal category, plus a phonetic to give an idea of the pronunciation. The Mayan system used logograms with phonetic complements like the Egyptian, while lacking ideographic components. 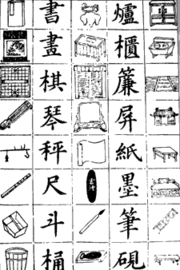 Chinese scholars have traditionally classified the Chinese characters (hànzì) into six types by etymology. The first two types are "single-body", meaning that the character was created independently of other characters. "Single-body" pictograms and ideograms make up only a small proportion of Chinese logograms. More productive for the Chinese script were the two "compound" methods, i.e. the character was created from assembling different characters. Despite being called "compounds", these logograms are still single characters, and are written to take up the same amount of space as any other logogram. The final two types are methods in the usage of characters rather than the formation of characters themselves. The first type, and the type most often associated with Chinese writing, are pictograms, which are pictorial representations of the morpheme represented, e.g. 山 for 'mountain'. The second type are the ideograms that attempt to visualize abstract concepts, such as 上 'up' and 下 'down'. Also considered ideograms are pictograms with an ideographic indicator; for instance, 刀 is a pictogram meaning 'knife', while 刃 is an ideogram meaning 'blade'. Radical-radical compounds, in which each element of the character (called radical) hints at the meaning. For example, 休 'rest' is composed of the characters for 'person' (人) and 'tree' (木), with the intended idea of someone leaning against a tree, i.e. resting. Radical-phonetic compounds, in which one component (the radical) indicates the general meaning of the character, and the other (the phonetic) hints at the pronunciation. An example is 樑 (liáng), where the phonetic 梁 liáng indicates the pronunciation of the character and the radical 木 ('wood') indicates its meaning of 'supporting beam'. Characters of this type constitute around 90% of Chinese logograms. Changed-annotation characters are characters which were originally the same character but have bifurcated through orthographic and often semantic drift. For instance, 樂 can mean both 'music' (yuè) and 'pleasure' (lè). Improvisational characters (lit. 'improvised-borrowed-words') come into use when a native spoken word has no corresponding character, and hence another character with the same or a similar sound (and often a close meaning) is "borrowed"; occasionally, the new meaning can supplant the old meaning. For example, 自 used to be a pictographic word meaning 'nose', but was borrowed to mean 'self', and is now used almost exclusively to mean the latter; the original meaning survives only in stock phrases and more archaic compounds. Because of their derivational process, the entire set of Japanese kana can be considered to be of this type of character, hence the name kana. Example: Japanese 仮名; 仮 is a simplified form of Chinese 假 used in Korea and Japan, and 假借 is the Chinese name for this type. The most productive method of Chinese writing, the radical-phonetic, was made possible by ignoring certain distinctions in the phonetic system of syllables. In Old Chinese, post-final ending consonants /s/ and /ʔ/ were typically ignored; these developed into tones in Middle Chinese, which were likewise ignored when new characters were created. Also ignored were differences in aspiration (between aspirated vs. unaspirated obstruents, and voiced vs. unvoiced sonorants); the Old Chinese difference between type-A and type-B syllables (often described as presence vs. absence of palatalization or pharyngealization); and sometimes, voicing of initial obstruents and/or the presence of a medial /r/ after the initial consonant. In earlier times, greater phonetic freedom was generally allowed. During Middle Chinese times, newly created characters tended to match pronunciation exactly, other than the tone – often by using as the phonetic component a character that itself is a radical-phonetic compound. Due to the long period of language evolution, such component "hints" within characters as provided by the radical-phonetic compounds are sometimes useless and may be misleading in modern usage. As an example, based on 每 'each', pronounced měi in Standard Mandarin, are the characters 侮 'to humiliate', 悔 'to regret', and 海 'sea', pronounced respectively wǔ, huǐ, and hǎi in Mandarin. Three of these characters were pronounced very similarly in Old Chinese – /mˤəʔ/ (每), /m̥ˤəʔ/} (悔), and /m̥ˤəʔ/} (海) according to a recent reconstruction by William H. Baxter and Laurent Sagart – but sound changes in the intervening 3,000 years or so (including two different dialectal developments, in the case of the last two characters) have resulted in radically different pronunciations. Within the context of the Chinese language, Chinese characters (known as hanzi) by and large represent words and morphemes rather than pure ideas; however, the adoption of Chinese characters by the Japanese and Korean languages (where they are known as kanji and hanja, respectively) have resulted in some complications to this picture. Many Chinese words, composed of Chinese morphemes, were borrowed into Japanese and Korean together with their character representations; in this case, the morphemes and characters were borrowed together. In other cases, however, characters were borrowed to represent native Japanese and Korean morphemes, on the basis of meaning alone. As a result, a single character can end up representing multiple morphemes of similar meaning but different origins across several languages. Because of this, kanji and hanja are sometimes described as morphographic writing systems. Because much research on language processing has centered on English and other alphabet languages, many theories of language processing have stressed the role of phonology (see for instance WEAVER++) in producing speech. Contrasting logographic languages, where a single character is represented phonetically and ideographically, with phonetic languages has yielded insights into how different languages rely on different processing mechanisms. Studies on the processing of logographic languages have amongst other things looked at neurobiological differences in processing, with one area of particular interest being hemispheric lateralization. Since logographic languages are more closely associated with images than alphabet languages, several researchers have hypothesized that right-side activation should be more prominent in logographic languages. Although some studies have yielded results consistent with this hypothesis there are too many contrasting results to make any final conclusions about the role of hemispheric lateralization in orthographic versus phonetic languages. Another topic that has been given some attention is differences in processing of homophones. Verdonschot et al. examined differences in the time it took to read a homophone out loud when a picture that was either related or unrelated  to a homophonic character was presented before the character. Both Japanese and Chinese homophones were examined. Whereas word production of alphabetic languages (such as English) has shown a relatively robust immunity to the effect of context stimuli, Verdschot et al. found that Japanese homophones seem particularly sensitive to these types of effects. Specifically, reaction times were shorter when participants were presented with a phonologically related picture before being asked to read a target character out loud. An example of a phonologically related stimulus from the study would be for instance when participants were presented with a picture of an elephant, which is pronounced zou in Japanese, before being presented with the Chinese character 造, which is also read zou. No effect of phonologically related context pictures were found for the reaction times for reading Chinese words. A comparison of the logographic languages Japanese and Chinese is interesting because whereas the Japanese language consists of more than 60% homographic heterophones (characters that can be read two or more different ways), most Chinese characters only have one reading. Because both languages are logographic, the difference in latency in reading aloud Japanese and Chinese due to context effects cannot be ascribed to the logographic nature of the languages. Instead, the authors hypothesize that the difference in latency times is due to additional processing costs in Japanese, where the reader cannot rely solely on a direct orthography-to-phonology route, but information on a lexical-syntactical level must also be accessed in order to choose the correct pronunciation. This hypothesis is corroborated by studies finding that Japanese Alzheimer's disease patients whose comprehension of characters had deteriorated still could read the words out loud with no particular difficulty. Studies contrasting the processing of English and Chinese homophones in lexical decision tasks have found an advantage for homophone processing in Chinese, and a disadvantage for processing homophones in English. The processing disadvantage in English is usually described in terms of the relative lack of homophones in the English language. When a homophonic word is encountered, the phonological representation of that word is first activated. However, since this is an ambiguous stimulus, a matching at the orthographic/lexical ("mental dictionary") level is necessary before the stimulus can be disambiguated, and the correct pronunciation can be chosen. In contrast, in a language (such as Chinese) where many characters with the same reading exists, it is hypothesized that the person reading the character will be more familiar with homophones, and that this familiarity will aid the processing of the character, and the subsequent selection of the correct pronunciation, leading to shorter reaction times when attending to the stimulus. In an attempt to better understand homophony effects on processing, Hino et al. conducted a series of experiments using Japanese as their target language. While controlling for familiarity, they found a processing advantage for homophones over non-homophones in Japanese, similar to what has previously been found in Chinese. The researchers also tested whether orthographically similar homophones would yield a disadvantage in processing, as has been the case with English homophones, but found no evidence for this. It is evident that there is a difference in how homophones are processed in logographic and alphabetic languages, but whether the advantage for processing of homophones in the logographic languages Japanese and Chinese is due to the logographic nature of the scripts, or if it merely reflects an advantage for languages with more homophones regardless of script nature, remains to be seen. This separation, however, also has the great disadvantage of requiring the memorization of the logograms when learning to read and write, separately from the pronunciation. Though not from an inherent feature of logograms but due to its unique history of development, Japanese has the added complication that almost every logogram has more than one pronunciation. Conversely, a phonetic character set is written precisely as it is spoken, but with the disadvantage that slight pronunciation differences introduce ambiguities. Many alphabetic systems such as those of Greek, Latin, Italian, Spanish, and Finnish make the practical compromise of standardizing how words are written while maintaining a nearly one-to-one relation between characters and sounds. Both English and French orthography are more complicated than that; character combinations are often pronounced in multiple ways, usually depending on their history. Hangul, the Korean language's writing system, is an example of an alphabetic script that was designed to replace the logogrammic hanja in order to increase literacy. The latter is now rarely used in Korea, but retains some currency in South Korea, sometimes in combination with hangul. According to government-commissioned research, the most commonly used 3,500 characters listed in the People's Republic of China's "Chart of Common Characters of Modern Chinese" (现代汉语常用字表, Xiàndài Hànyǔ Chángyòngzì Biǎo) cover 99.48% of a two-million-word sample. As for the case of traditional Chinese characters, 4,808 characters are listed in the "Chart of Standard Forms of Common National Characters" (常用國字標準字體表) by the Ministry of Education of the Republic of China, while 4,759 in the "Soengjung Zi Zijing Biu" (常用字字形表) by the Education and Manpower Bureau of Hong Kong, both of which are intended to be taught during elementary and junior secondary education. Education after elementary school includes not as many new characters as new words, which are mostly combinations of two or more already learned characters. Also due to the number of glyphs, in programming and computing in general, more memory is needed to store each grapheme, as the character set is larger. As a comparison, ISO 8859 requires only one byte for each grapheme, while the Basic Multilingual Plane encoded in UTF-8 requires up to three bytes. On the other hand, English words, for example, average five characters and a space per word and thus need six bytes for every word. Since many logograms contain more than one grapheme, it is not clear which is more memory-efficient. Variable-width encodings allow a unified character encoding standard such as Unicode to use only the bytes necessary to represent a character, reducing the overhead that results merging large character sets with smaller ones. Look up logogram in Wiktionary, the free dictionary. ^ Most have glyphs with predominantly syllabic values, called logosyllabic, though Egyptian had predominantly consonantal or poly-consonantal values, and is thus called logoconsonantal. ^ "Determinative" is the more generic term, however, and some authors use it for Chinese as well (e.g. William Boltz, in Daniels and Bright, 1996, p. 194). ^ Coe, Michael; Van Stone, Mark (2001). Reading the Maya Glyphs. p. 18. ISBN 978-0500285534. ^ Li, Y.; Kang, J. S. (1993). "Analysis of phonetics of the ideophonetic characters in modern Chinese". In Chen, Y. (ed.). Information Analysis of Usage of Characters in Modern Chinese (in Chinese). Shanghai Education Publisher. pp. 84–98. ^ Baxter, William H.; Sagart, Laurent (20 February 2011). "Baxter-Sagart Old Chinese reconstruction". ver. 1.00. École des Hautes Études en Sciences Sociales. Retrieved 12 April 2011. For summary information, see: Reconstructions of Old Chinese § Baxter–Sagart (2014). ^ Hanavan, Kevin; Jeffrey Coney (2005). "Hemispheric asymmetry in the processing of Japanese script". Laterality: Asymmetries of Body, Brain and Cognition. 10 (5): 413–428. doi:10.1080/13576500442000184. ^ Vedonschot, R. G.; La Heij, W.; Paolieri, D.; Zhang, Q. F.; Schiller, N. O. (2011). "Homophonic context effects when naming Japanese kanji: evidence for processing costs". The Quarterly Journal of Experimental Psychology. 64 (9): 1836–1849. doi:10.1080/17470218.2011.585241. ^ Verdonschot, R. G.; LaHeij, W.; Schiller, N. O. (2010). "Semantic context effects when naming Japanese kanji, but not Chinese hànzì". Cognition. 115: 512–518. doi:10.1016/j.cognition.2010.03.005. ^ a b Hino, Y.; Kusunose, Y.; Lupker, S. J.; Jared, D. (2012). "The Processing Advantage and Disadvantage for Homophones in Lexical Decision Tasks". Journal of Experimental Psychology: Learning, Memory, and Cognition. 39: 529–551. doi:10.1037/a0029122. ^ Vedonschot, R. G.; La Heij, W.; Paolieri, D.; Zhang,, Q. F.; Schiller, N. O. (2011). "Homophonic context effects when naming Japanese kanji: Evidence for processing costs". The Quarterly Journal of Experimental Psychology. 64 (9): 1836–1849. doi:10.1080/17470218.2011.585241. ^ Nakamura, K.; Meguro, K.; Yamazaki, H.; Ishizaki, J.; Saito, H.; Saito, N.; et al. (1998). "Kanji predominant alexia in advanced Alzheimer's disease". Acta Neurologica Scandinavica. 97: 237–243. doi:10.1111/j.1600-0404.1998.tb00644.x. ^ Sasanuma, S.; Sakuma, N.; Kitano, K. (1992). "Reading kanji without semantics: Evidence from a longitudinal study of dementia". Cognitive Neuropsychology. 9: 465–486. doi:10.1080/02643299208252068. ^ See Hino et al. (2012) for a brief review of the literature. ^ Haigh, C. A.; Jared, D. (2007). "The activation of phonological representations by bilinguals while reading silently: Evidence from interlingual homophones". Journal of Experimental Psychology: Learning, Memory, and Cognition. 33: 623–644. doi:10.1037/0278-7393.33.4.623. Citing Ferrand & Grainger 2003, Haigh & Jared 2004. ^ "현판 글씨들이 한글이 아니라 한자인 이유는?". RoyalPalace.go.kr (in Korean). Retrieved 26 November 2017. Daniels, Peter T.; Bright, William, eds. (1996). The World's Writing Systems. Oxford University Press. ISBN 9780195079937. Wikimedia Commons has media related to Logograms.